The cultural component in this year’s Annual Sports and Cultural Meet was pretty prominent, with the Brindavan and Prashanti Nilayam campuses of the University putting up dramas. 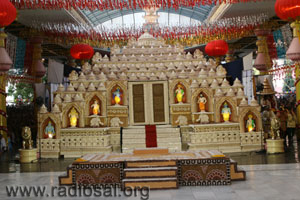 The themes selected were devotional and surcharged with the students' love for their beloved Swami. On the 13th, the students of the Brindavan campus got permission to put up their drama and so from 12 noon itself, work began in right earnest to erect the sets. 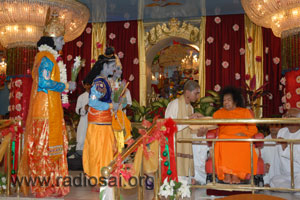 It was complete only by 4:40 PM after which at about 4:50 PM, Swami arrived for darshan in the car. 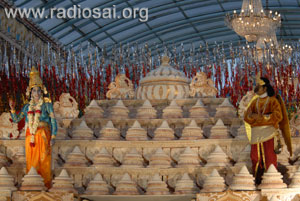 As Swami completed the ladies side darshan round and moved into the stage area, the entire set and backdrop lay hidden behind a huge veil. Completing the darshan round, Swami moved into the interview room. Slowly the sets were put in place and everyone waited eagerly. Huge television screens had been put up in various parts of the hall to facilitate comfortable viewing for all. 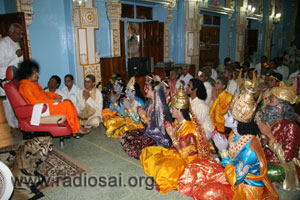 Swami moved into the bhajan hall where all the participants of the drama were seated. He interacted with them for about 10 minutes and enquired into the roles and costumes of many of the actors. 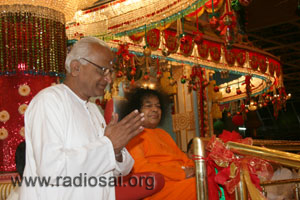 It was about 5:20 PM when Swami came out and sat onstage and asked for the programme to begin. Along with the veil, jaws dropped upon beholding the magnificence and splendour of the intricate sets. Towering till the roof and standing about 30 feet across, just admiring all different facets would have taken an hour! 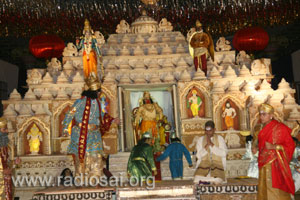 The drama to be staged was entitled, "Bhakta Potana." Four students playing major roles in the drama came up to Swami and presented Him the card and flowers of dedication. 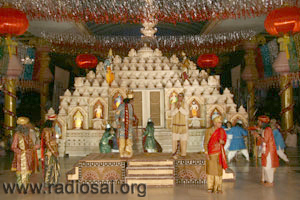 The drama opened with the scene at the magnificent temple that had been set. The inspiring story of the devotee-poet Pothana was threaded as a discussion between Lord Vishnu and Garuda, His divine eagle-mount. Pothana firmly believes in the truth that only that is worthwhile which is dedicated to the Lord. His relative, the poet Srinatha (literally meaning,"the Lord of Wealth") tries to persuade him to get salvation for himself through riches and fame. 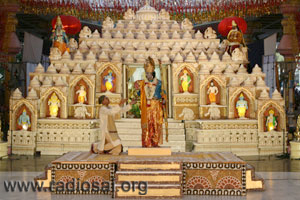 But Pothana becomes the true "Sri-Natha" by making the Lord his treasure. He works miracles through his sheer love for the Lord and cures a rich atheistic and cynical landlord, Gajendra of his paralysis. The high point in Pothana's life occurs when Lord Rama appears in person in his presence and commands him to write the Bhagavatham in Telugu. Implicit obedience to His Lord has made Pothana a household name in Andhra Pradesh today where his Bhagavatham is revered and adored. The Padma Nayaka king of Warangal, Sarvajana Singha Bhoopaala , wanted Pothana to dedicate 'Andhra Maha Bhagavatamu' to him. The king was himself a scholar and wrote many works including Rasdrnavasudhdkara-a well known Sanskrit drama. But, Pothana refused to obey the king's orders and dedicated the Bhagavathamu to Lord Rama, whom he worshiped with great devotion. He believed poetry was a divine gift and it should be utilized for salvation by devoting it to the God. The king got infuriated and commanded his troops to destroy the work saying that if it was truly Rama's property, He would protect it. The whole village decided to stand as a shield but were soon crushed by the brutal force of the soldiers. Finally when all was seemingly lost, an invisible force blew away all the soldiers. The true devotees at the scene see the great devotee Hanuman protecting his Lord's work! The king begs pardon and all celebrate the glory, grandeur and Love of the Lord. Threaded into the drama were beautiful songs, dances and stories of the mischievous Lord Krishna from the Bhagavatham. The devotion filled evening came to a close with the massive final formation. What a unique idea it was! 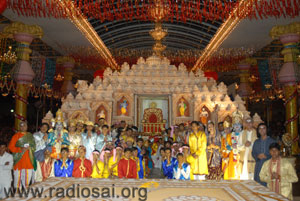 All the participants of the drama came forward and offered aarthi to Swami. A simultaneous 100 aarthi performance was indeed a sight to behold. As they concluded, Swami was so very happy and proud. He seemed to get quite emotional as the final song spoke the Truth of how He was the ultimate redeemer and support. 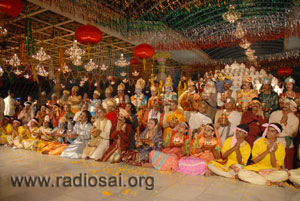 Once the song and dance concluded, in a spontaneous gesture, Swami beckoned the student playing the role of Pothana and created a gold chain for him. What followed next was a series of group photographs wherein all the participants of the drama - those on stage and those off it too- came to Swami in small groups and had a memorable picure taken. 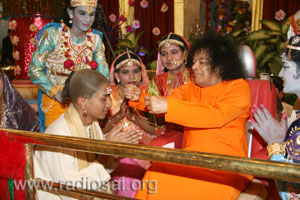 When Swami gives, which is something He does so very often, He gives completely. Everyone was so joyous and dozens of letters and cards exchanged hands. Swami spoke to many of the students fulfilling many dreams in that one quick moment. After the whole session, Swami told all the students to sit against the magnificent backdrop and asked the photographer to take pictures of that beautiful sight. Then, calling the warden of the Brindavan campus, Swami expressed appreciation for the drama. He also promised, "After I visit Muddenahalli, I will come and stay in Brindavan. That time put up a full 3 hour drama on the Bhagavatham and I will see it." Needless to say there was a rapturous applause at this joyous news. Receiving aarthi and having the announcement made prize distribution for the students would take place the following day on the holy occasion of Sankranthi, Swami retired for the day. Dear reader, do you like this section? Does it help you? What improvements do you suggest to make it more informative and inspiring for you? Please tells us at h2[email protected].